KAVANAGH (Cavanagh), LAURENCE (Lawrence), merchant, militia officer, politician, jp, and judge; b. 1764 in Cape Breton, probably at Louisbourg, second of three sons of Laurence Kavanagh and Margaret Farrell; m. by 1789 Felicité LeJeune, daughter of a merchant at Little Bras d’Or Passage (N.S. ), and they had five sons and three daughters; d. 20 Aug. 1830 in St Peter’s, N.S. The Kavanaghs were one of the first English-speaking families to settle in Cape Breton after the fall of Louisbourg in 1758. 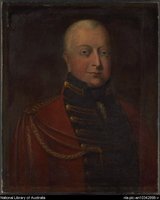 Laurence Kavanagh’s father immigrated to St John’s, Nfld, from Waterford (Republic of Ireland) and by 1760 was living in Louisbourg, where he was supplying the British garrison. In 1774 he was killed in a shipwreck on his way to Halifax, leaving his two sons, James and Laurence, a prosperous business. By 1777 the family had moved to St Peter’s. Located on the narrow isthmus separating the Bras d’Or lakes from the Atlantic Ocean, the settlement was adjacent to the abundant fishery off Isle Madame and was an important centre of communications and commerce on Cape Breton. In order to increase business, James moved to Halifax, where he planned to centre operations, and left the 14-year-old Laurence in charge of their interests in Arichat, Main-à-Dieu, St Peter’s, and even present-day New Brunswick. The young man showed much business acumen and shrewdly built the Cape Breton operation into a commercial success by supplying the needs of settlers from the Strait of Canso to the Margaree River, often by barter. In 1797 he and Richard Stout*, Sydney’s wealthiest merchant, were described as “owning” three-quarters of Cape Breton’s population. Although this claim cannot be substantiated, there is no doubt that Kavanagh and Stout must have controlled a large proportion of the island’s commerce. 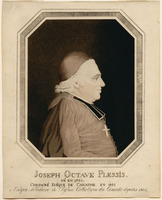 When Bishop Joseph-Octave Plessis visited Cape Breton in 1815 he described Kavanagh’s property as a “magnificent estate” and Kavanagh as a “rich Irish merchant, who had a thriving business.” By that time Kavanagh was shipping barrels of fish as far as the Gulf of Mexico. Kavanagh’s wealth made him a powerful figure in southern Cape Breton, and his status was recognized by the provincial government in Sydney, which appointed him a captain of militia. Because of St Peter’s distance from and poor communications with Sydney, Kavanagh was almost absolute ruler in his district. In 1811, when the colony’s administrator, Nicholas Nepean, ordered a census, Kavanagh refused to divulge the extent of his holdings. Despite his importance, he was never appointed to the colony’s Executive Council as were neighbouring merchants such as the Jerseyman John Janvrin or the loyalist George Moore. No reason is known for this exclusion, though Cape Breton could have been following Nova Scotia’s example of not permitting Roman Catholics to hold any but lesser offices. In keeping with his position, Kavanagh played the role of lord of the manor, welcoming visitors to the St Peter’s area with boundless hospitality. Like Plessis, the Presbyterian minister James Drummond MacGregor was much impressed. Cape Breton was reattached to Nova Scotia in October 1820, and in the elections to the House of Assembly held shortly thereafter Kavanagh became one of the two representatives from the island. His identification with the Acadians and Irish, his financial power, his status as patriarch of his area, and perhaps even his independence from the former rulers in Sydney assured his victory. A defeated candidate, Edmund Murray Dodd*, alleged that there had been irregularities in the election, but his petition was dismissed by the assembly on 13 Feb. 1821. The house was dissolved on 3 March before Kavanagh took his seat. The real obstacle to Kavanagh’s admission, however, was his religion. Anyone wishing to hold a seat in the assembly had to take an oath against transubstantiation, a basic tenet of Roman Catholicism. Catholics had laboured under other disqualifications, but over the years the assembly had abolished them until only the transubstantiation oath remained. Lieutenant Governor Sir James Kempt* sensed that the mood of the province was now more liberal, and began to smooth Kavanagh’s way. He informed the Colonial Office that no law expressly forbad Roman Catholics from holding legislative office and that he favoured the admission of Kavanagh. The colonial secretary, Lord Bathurst, replied that he would be prepared to allow Kavanagh to be admitted once he had presented himself to claim his seat. When Kavanagh appeared early in the 1822 session he refused to take the oath against transubstantiation and was denied admission. After some bickering between assembly and Council the latter presented an address to the crown asking for the removal of the oath. Bathurst promptly replied that Kavanagh was to be allowed to take his seat without the oath. 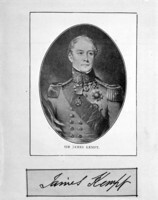 The resolution of the problem was deferred until 3 April 1823, when Kempt sent a message to the assembly reporting Bathurst’s decision. A last-minute effort was launched by members from the overwhelmingly Protestant counties of Lunenburg and Cumberland and in the Annapolis valley to prevent Kavanagh’s admission. But under the leadership of Richard John Uniacke Jr, Kavanagh’s fellow representative from Cape Breton, assemblymen from Halifax, Queens, and Shelburne counties succeeded in having a motion passed which allowed Kavanagh to take his seat without the oath. It was also decided that the same privilege would be extended to all Roman Catholics who were duly elected. 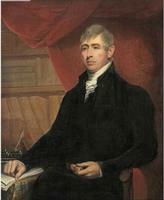 Kavanagh served in the assembly until his death in 1830. His most memorable contribution was his survey of educational conditions in Cape Breton in 1824. Kavanagh’s wide knowledge and the respect in which he was held on the island allowed him to paint the first accurate picture of the educational situation in this newly annexed part of Nova Scotia, and his report helped form the basis for the province’s School Act of 1826. While sitting in the house, Kavanagh continued as justice of the peace and member of the Inferior Court of Common Pleas for Cape Breton County, positions which he had received at an unknown date. Kavanagh’s significance is both local and international. Locally, he was partly responsible for rebuilding the economy of southern Cape Breton after the fall of Louisbourg. His energy led him to become a key mover in the social and political development of that area and the first native Cape Bretoner to sit in the Nova Scotia assembly. His widest fame lies in his being the first English-speaking Roman Catholic to hold a seat in a legislature in the Atlantic provinces, six years before such a right was won in Britain. The fact that this landmark was achieved in Nova Scotia indicates both the political maturity of that colony and Kavanagh’s perspicacity. His admission was accomplished with a minimum of acrimonious debate and a realization that laws against Roman Catholics were anachronistic. Kavanagh deserves credit for his great patience in allowing Kempt, the Colonial Office, and the legislature time to work out the delicate arrangements. PAC, MG 11, [CO 217] Cape Breton A, 8. PANS, RG 1, 64, doc.46. PRO, CO 217/113, 217/140. N.S., House of Assembly, Journal and proc., 1821, 1823. Free Press (Halifax), 9 April 1823. Directory of N.S. MLAs. Johnston, Hist. of Catholic Church in eastern N.S., vol.1. A. A. MacKenzie, The Irish in Cape Breton (Antigonish, N.S., 1979). T. M. Punch, Some sons of Erin in Nova Scotia (Halifax, 1980). D. J. Rankin, “Laurence Kavanaugh,” CCHA Report, 8 (1940–41): 51–76; also issued as a separate pamphlet. Anthony Traboulsee, Laurence Kavanagh, 1764–1830: his life and times, including brief sketches of the history of Nova Scotia (Acadie) and Cape Breton Island (Isle Royale) . . . (Glace Bay, N.S., 1962). [Only the appendices of these two works are of value. r.j.m.] Journal of Education (Halifax), 4th ser., 6 (1935). R. J. Morgan, “KAVANAGH, LAURENCE,” in Dictionary of Canadian Biography, vol. 6, University of Toronto/Université Laval, 2003–, accessed April 20, 2019, http://www.biographi.ca/en/bio/kavanagh_laurence_6E.html.